An excellent science-fiction/conspiracy thriller. The Columbia Review. “Truth Insurrected: The Saint Mary Project” is a suspenseful thriller featuring former FBI agent William Harrison—a reluctant yet admirable hero, who finds himself hot on the trail of a major extraterrestrial cover-up. This is a strong debut novel from author Daniel P. Douglas that succeeds in uncovering fresh ideas and original plotlines while exploring familiar science fiction grounds. With a beginning reminiscent of genre detective stories, we first meet Harrison in less glorious circumstances, spying on cheating spouses for his livelihood. But soon enough, our hero is drawn into a series of dangerous events and rising complication by a combination of unfortunate coincidence, insatiable curiosity and rugged determination to uncover the truth—whatever is the risk to life and limb. 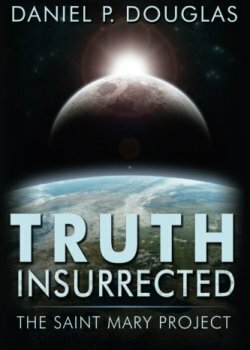 “Truth Insurrected” brings about all the necessary ingredients for a great science-fiction thriller built around an ill-conceived government conspiracy: A good guy who—at no fault of his own—is sucked into the vortex of disastrous events; well-equipped yet fumbling government forces—led by heartless and ultimately incompetent generals; genius scientists—who are too detached from reality to be useful when the going gets tough; lots of sophisticated weaponry—which turns out to be less than a match for the job, and the most essential players—the extraterrestrial enemy who, in the competent hands of the author, are more powerful and ominous than ever before. Also notable here is the author’s attention to detail in describing the various settings—mostly southwest locations, with a mix of major world capitals and the infamous Area 51, which all feel real to the reader. The dialogue scenes ring with authenticity, and the suspense grows with solid pace and satisfying bursts of action. The introduction of characters from Harrison’s former life as an FBI agent, including his old partner and some Russian variants, together with a touch of romance, gives the story—and Harrison—an emotional depth and human credibility that might be missing from other works in this genre. And as the ending approaches, a masterful buildup of anticipation (and a menacing countdown!) brings everything together to a very satisfying climax. “Truth Insurrected: The Saint Mary Project” is an excellent debut thriller, and Harrison is a promising lead that should be back for more. Highly recommended!